For a career to be satisfying, it is not a mandatory factor that the job should pay well. Maybe the job provides a good paycheck or is a career with good pay, but at the end of the day, you don’t feel good about your job. Sometimes it is the other way round, maybe your job is one of the noblest professions or best jobs in the world, but you are not satisfied with your pay scale. In some cases, one may not even find the right employee motivation to work in an industry. They may feel that waking up and getting ready for work is a huge task. These are all indications that your job is not satisfactory for you. Here comes the issue of job satisfaction. This can be especially true for a profession that has a limited scope for growth and there is much room for development for the employee. You might think that this is the same case for everyone, but in reality that is not true at all. When you look through the real facts you might be surprised to find that you are actually a part of a very small minority of workers. You may ask, “How?”, but recent studies have shown that at least a quarter of the people in the US have stated that they are very much satisfied with their jobs. Furthermore in a employee satisfaction survey, out of the surveyed people 88% have reported that they are satisfied with their jobs and out of this group over 50% of people have stated that they are very much satisfied with their jobs, only a small 4% of people have complained that they are very dissatisfied with their work. Having contentment in one’s own job is one of the main factors of job satisfaction and why many people love their jobs. That is, if you do not enjoy your job, chances are that you won’t be satisfied by it. The main reason for such a fluctuation among opinions is because of the nature of the jobs. People who are very much unhappy with their jobs do not have a chance to express themselves, they usually follow a strict timetable and sometimes they do not get any chances for utilizing their skills and abilities. People who are very satisfied with their jobs not only have a stable pay scale, they also get to do everything that can help them develop as a working individual. So if you are one of the 4% and is considering a career change then the following is the list of the most satisfying professions. Engineers are considered to have one of the most rewarding careers in the world. Forbes magazine has stated that a software assurance engineers is one of the few people who have a satisfactory career. The main reason for this is because the job of an assurance engineer revolves around all the processes that take place within the company. This includes the requirement gathering, setting up the targets, checking the source code and the final code, checking the testing parameters and so on. They are also responsible for the documentation and also take apart in the alpha and beta testing of the product and are also authorized for implementing any changes during the production of the software. Another main reason why assurance engineers are considered as one of the most satisfied employees is the amount of money that they can make. An assurance engineer is expected to make up to $100,000 annually. Many software assurance engineers have reported that they are much satisfied with their colleague and fellow employees and they are also happy with their daily tasks and the amount of work that they receive. Moreover, because of the nature of their professions, they are considered as an important part of the IT industry. This is because, without the help of an assurance engineer, it is impossible for a company to release their products and services that are satisfactory to the customers in the market. Hence, they are considered as the brain behind releasing high quality software. Coming at second place for the most satisfying job is the humble teacher careers. There are many reasons why teaching is considered as a satisfactory job. Not only it pays well, but a profession is also a good form of social work and teachers are seen as valuable members of society and an irreplaceable part of a country’s development. Not only is it satisfactory, but it is also a rewarding job as well and makes a huge impact on a nation’s educational level. In a child’s life, especially during the early years of social development and learning, teachers play an important role in helping them understand the rules and norms of the outside world. Teachers also help a child to become a responsible adult and a valuable member of the society by helping, to be productive for their friends, family and the people around them. Moreover, the job of a teacher requires the professionals to adapt to a new role every day. Sometimes they might act as a mentor to the kids, next day as a friend or even in some cases as a second parent to kids. Also, teachers are not limited to teaching to only one subject, their profession calls for versatility and adaptability depending on the child’s ability to understand. One day they might be teaching biology, the next day they would be demonstrating gymnastics to students. Whatever the situation calls for, a teacher has to be always ready and prepared. Not only has this made it a responsible profession, but also a fruitful one for many. Watching their students grow and develop into responsible adults is one of the most satisfactory moments that any teacher could have. The third profession that is in the list is the job of a nurse. Not only are their jobs rewarding, but they also help a crucial role in saving lives of people. This makes the nurse a valuable member of the society and is respected by all ages. It is a known fact that most nurses are overshadowed by medical practitioners and doctors, but this does not change the fact that a majority of the nurses love their job and the associated perks that the profession provides. Similar to doctors, nurses are considered as an important part of the medical industry. The main reason being that the profession of a nurse requires them to be always alert and on their feet and they should be able to tackle any kind of emergency situation. Also, being a nurse is not an easy task. The main reason being that it takes years and years of studying and practice just to become a successful nurse. This is the main reason why people who have a serious passion for saving lives of people follow this path. Being a nurse is not for the faint hearted as each day at the hospital is not only unpredictable, but each day provides an experience to understand and learn from both as a professional and as a human being. Another reason why many nurses love their job is because of the level of familiarity and relationship that they maintain between them and their parents. Nurses are considered as the most trusted profession and most satisfactory careers in the world, and they are even more trusted than doctors and medical practitioners. Doctors and medical practitioners are one of the most mandatory and highly sought after profession in a society. Doctors have the power to save lives which make them be seen as a modern day superhero. Many medical practitioners are considered as lifesavers and they help in the development and upliftment of a society. Although it may not seem much, they have the power to touch and influence one’s lifestyle and behavior and they are able to change the lives of many. This is why they are no less considered as saviors in this day and age. One of the main reasons why many medical practitioners love their job is because they have the opportunity to meet a wide variety of people and patient every day. They get to see and meet people from various walks of life, irrespective of their gender, age and social status. It is to be noted that not anyone can be a wonderful doctor. It takes years of hard work and patience to be able to become a doctor, not to mention a large debt for college fees. Another reason why they are very much satisfied with their professions is the level of respect and love that they receive from the members of the society. Since it is a noble profession, most people do look up to doctors and see them in a positive light. With the fast advancement of science and technology, it makes possible for doctors to save lives, which makes their profession more fruitful and worthy. Saving a life of a person is one of the greatest gifts that a doctor can receive while working. 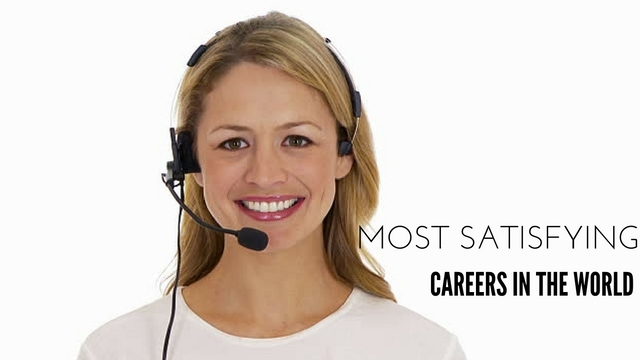 One might not believe that having a personal assistant job can be extremely satisfactory and rewarding. This might be because many people have the idea that having a job as a personal assistant is one of the hardest jobs in the world. Keep in mind that these are just stereotypical notions about the job because many books and streams have depicted the job of a personal assistant in a negative manner. But in reality, the job of a personal assistant is rather fun and happening and it gives a chance for the individual to showcase their skills and abilities. Many personal assistants have stated that they are very much satisfied with their line of work when compared to their peers who are involved in other forms of employment. Another factor why many personal assistants are satisfied with their jobs is the amount of money that they get paid. Similar to that of other satisfactory jobs, the role of a personal assistant is not always fixed and follows the same pattern every day. They have to use their creativity along with logical and reasoning abilities to solve many problems and emergencies, hence making themselves prepared and ready to tackle any kind of situations that might come in the way. They are the ones that make sure that the client is performing smoothly without any distractions or obstacles. Moreover, being a personal assistant means that plenty of hours are spent for a single person and their development, that it forms as a good chance to have a strong professional bond with them. Many personal assistants are respected and looked up to by their clients and supervisor because of the help and support that they provide for them. While searching for the most satisfactory job in the working industry, keep in mind that these are not the only satisfactory jobs out there. At the end of the day, motivation and job satisfaction from a working individual is usually based on their own personal perspective. So if you love your job and love what you do, chances are that you are highly satisfied with your job. The immense work satisfaction in your job is what makes you get enthusiastic and do their work every day. It has been proven that jobs involving helping and welfare of people have the most satisfied employees since they know that their hard work is helping the society bit by bit. Also, it should be noted that money and career satisfaction do not go hand in hand and that there is no direct relation between the two factors. For example gardeners, construction workers and plumbers also have the most satisfactory jobs. In the end what matters the most is how you have you used your skills and abilities to create something beneficial not only to you but also to the people associated with you. This is the real secret behind what makes a job highly satisfactory.